Response: After Orophin enters play, return a Silvan ally from your discard pile to your hand. Response: After Ered Nimrais Prospector enters play, discard the top 3 cards of your deck. Then, choose and shuffle 1 card from your discard pile back into your deck. Attach to a Lore hero. Reduce the cost to play Scroll of Isildur by 1 for each hero you control with a printed Lore resource icon. Action: Discard Scroll of Isildur to play any Lore event card in your discard pile as if it were in your hand. Then, place that event on the bottom of your deck. Attach to a Tactics hero. Reduce the cost to play Book of Eldacar by 1 for each hero you control with a printed Tactics resource icon.Action: Discard Book of Eldacar to play any Tactics event card in your discard pile as if it were in your hand. Then, place that event on the bottom of your deck. Cannot have restricted attachments. Response: After Gwaihir enters play, search your discard pile for an Eagle ally and put it into play under your control. At the end of the round, if that ally is still in play, add it to your hand. X is the number of players in the game. Action: Starting with the first player, each player chooses 1 different option: ready a hero he controls, add 1 resource to the resource pool of a hero he controls, draw 1 card, or shuffle 1 card from his discard pile into his deck. Action: Each player returns the topmost attachment card from his discard pile to his hand. Attach to Kahliel. Each Harad character gets +1 Willpower. Refresh Action: Exhaust Kahliel's Headdress to shuffle the topmost Harad ally in your discard pile into your deck. Response: After an ally is destroyed, exhaust 1 Eagle character to move that ally from the discard pile to its owner's hand. 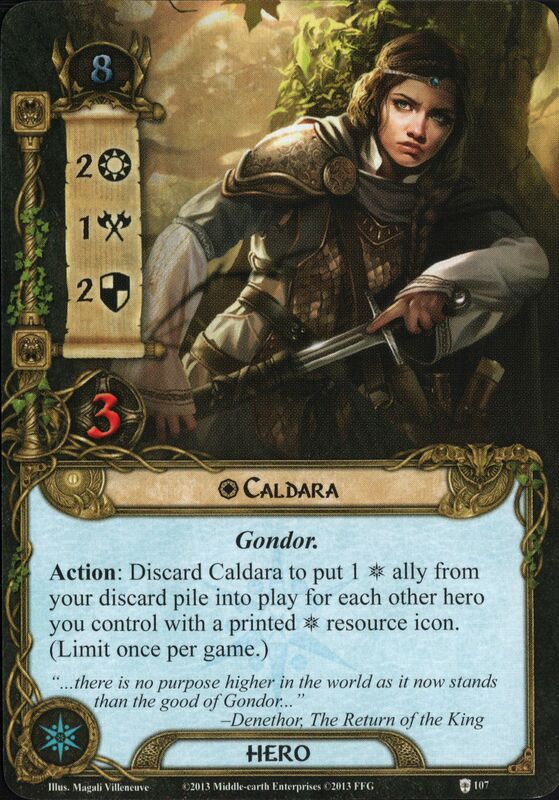 Veteran Sword-elf gets +1 Attack and +1 Defense for each copy of Veteran Sword-elf in your discard pile. You may exhaust any number of Healer characters you control as part of this card's cost. 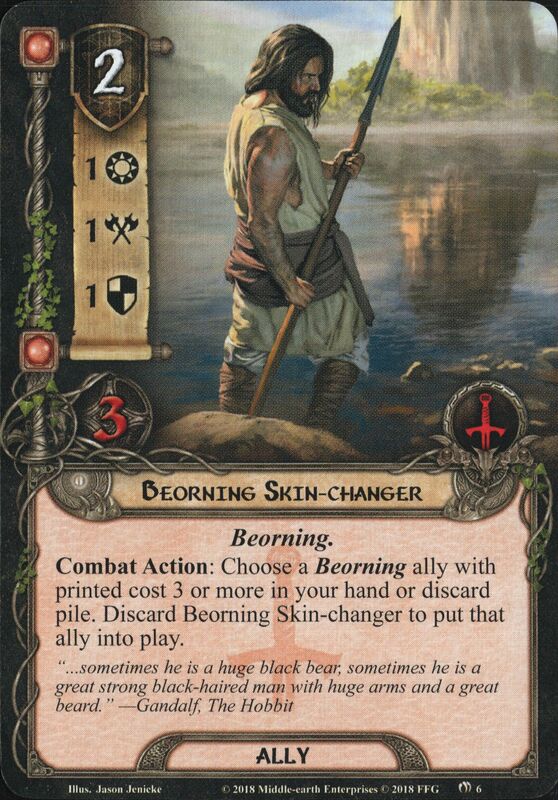 Reduce the cost to play this card by 1 for each Healer character you exhaust in this way. Refresh Action: Choose a hero in any player's discard pile. Put that hero into play under its owner's control, with 1 damage token on it. Response: After an enemy is declared as an attacker against you, declare an exhausted character you control as the defender. Resolve that effect again for each copy of Anchor Watch currently in your discard pile (all chosen characters are defending against this attack). Response: After an ally leaves play, add it to its owner’s hand instead of placing it in the discard pile. 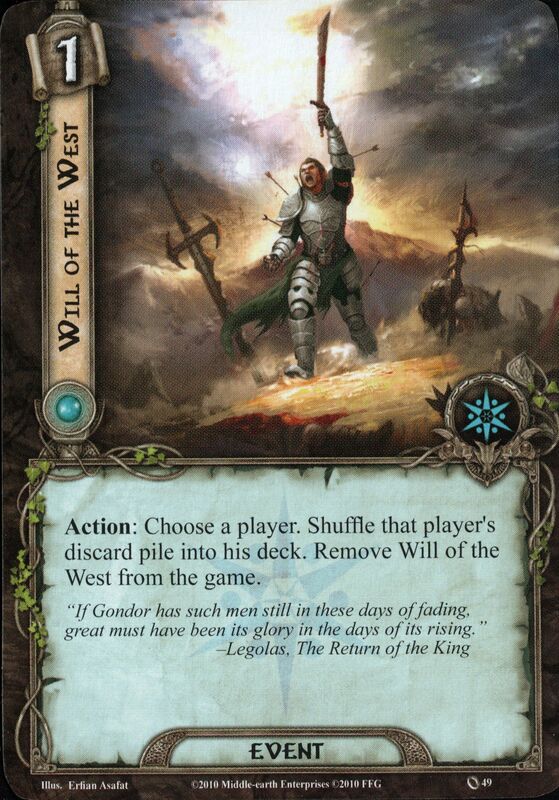 Valour Action: Until the end of the phase, add each ally that leaves play to its owner's hand instead of placing it in the discard pile.